Today the in-laws have made their way home but The Mister was able to spend a final day which them. Unfortunately the weather was not amazing but I think they had a nice walk and my mother-in-law ate her gazillionth crab salad this week. 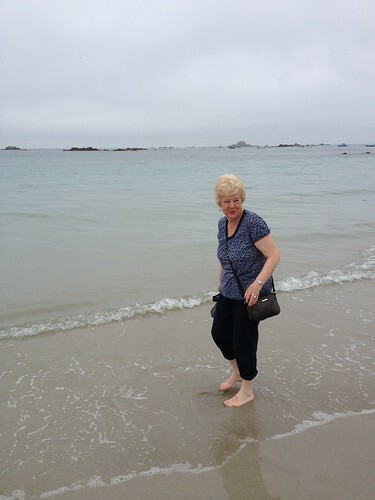 She also managed to have a little paddle in the sea… I reckon it was chilly! For the next few days The Mister and I will be attending Sark Folk Festival. So, daily pictures will be forthcoming when I return. 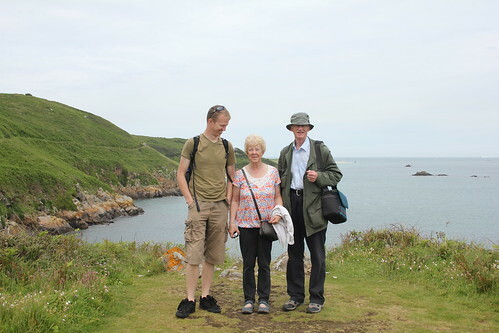 Today is The Mister’s parents last day in Guernsey. I was working today so they went out visiting a few places and tonight we went out for dinner. 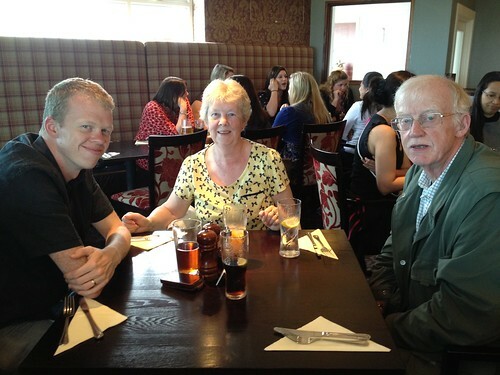 It has been lovely to see them and I hope they enjoyed themselves on our beautiful island. Next time they come and visit we might have decorating for them to do! Today I took the day off work and The Mister and his parents and I went over to Herm Island. A dinky, tiny and perfectly formed island just 3 miles by 1 1/2 miles, Herm is wonderful. It is peaceful and beautiful with sandy white beaches and walks across cliffs and through wooded areas. Whilst Herm never disappoints the weather can sometimes be a little bit hit and miss. Nice and sunny when we started we did have a few drops of rain over the day but not enough to spoil our day out. We are now home and feeling Herm tired. All that fresh air can’t be good for one! There are a few more photos of our day out here. The Mister is at work today so this afternoon the in-laws and I went to Saumarez Park as there was a classic car show. There were loads of lovely cars, but this one has captured my heart! 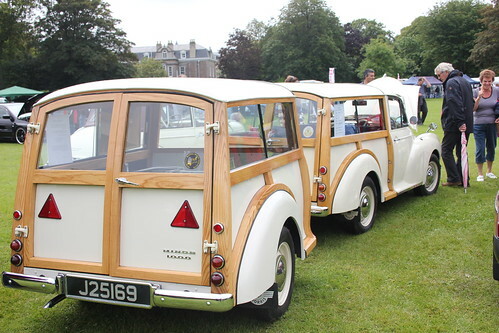 I have always wanted a Morris Minor, but this is a 1971 Morris Traveller with matching trailer. It was tricky to get a decent picture of the whole length of the car because there were cars parked either side. I commented to the owner that I would kill to have this car and then I noticed that he had tracheostomy which meant he had to cover the hole to speak and even then his voice was raspy, so not the brightest thing to say! He told me that this car had indeed nearly killed him and it I had taken all his pocket money for at least two years. He seemed to be rather tickled by my absolute delight in the car which he called Lucie. Gorgeous! One day I will own a Morris Minor! This morning the in-laws and I went to the Farmer’s Market as The Mister was working. This afternoon however we did something distinctly different and we all went to Vazon beach to watch the sand racing. This week it was motorbikes and bikes and sidecars and is it completely mental, especially the bikes and sidecars. Any event that treats a human body as ballast cannot be a good thing! They fling themselves around the corners and it is completely nuts to watch but it is really fun. There was quite a lot of people there and the weather was lovely. 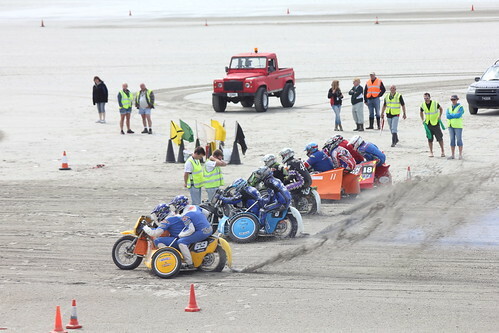 When I was younger we regularly used to go as a family to watch the sandracing, often with my Uncle Steve and his family. Today I caught a whiff of the petrol and the sea and it took me right back to being a child again. I’d forgotten how quickly a certain smell can transport one back to a time or a place. Amazing. Today I took the afternoon off work and went out with The Mister and the in-laws. We went to visit the house that Victor Hugo lived in when he was in exile in Guernsey. Victor Hugo lived in Hauteville House from 1856 – 1870. Hauteville House is such a weird place. It has four floors and the ground floor is really dark with rather random furniture that Hugo has built. The dining room looks like a public lavatory with lost of Delft tiles on the wall. As you go up through the floors of the house it gets lighter and lighter and there are rooms with more glass. When you get to the top floor there is this gorgeous little room with a kind of conservatory in the sky and a tiny little bedroom next door with a simple mattress on the floor which apparently is where Victor Hugo slept. 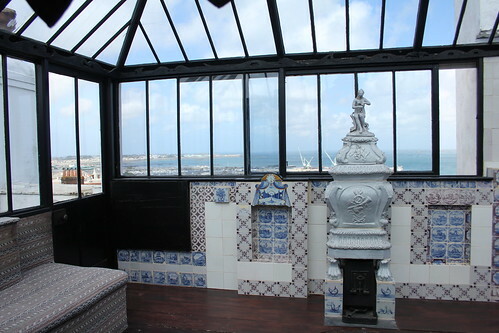 The picture of the day is of the conservatory in the sky which is where Victor Hugo would work. Apparently he would spread his manuscripts out across the sofas in the room and he would stand in the corner at the little black table that lies flat against the wall in this picture and he would write. It has the most glorious view out across St Peter Port, Castle Cornet and out to Herm and Sark. It’s well worth a visit and the property is now owned by the City of Paris so it is also the French Consulate in Guernsey. Very strange property but fascinating. I had a mega-busy day at work and then we took The Mister’s parents to see the new house (which we haven’t quite yet bought but I can’t be bothered to go into the saga!) so we went out for dinner tonight at The Rockmount. As always the food was good but it was very noisy. 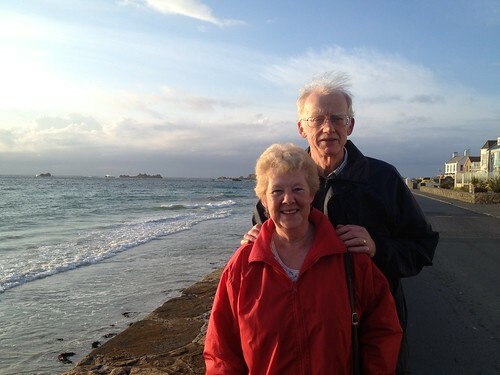 We walked back along the coast and I managed to snap this quite picture of The Mister’s Mum and Dad. Of course his Mum won’t like this photo, but then again she isn’t keep on being photographed at all! I think it is a good pic of both of them. Well today I have spent the whole day in a training session on Safer Injecting. It was really good training but it wasn’t very exciting to photograph. In contrast The Mister has been taking his parents out for the day to visit some of the tourist attractions. In fact, for the next few days, he may be the one contributing the photographs in the interest of it being more interesting! This is the The Little Chapel which was started in 1914 by Brother Deodat. He wanted to re-create a miniature version of the famous grotto and basilica at Lourdes in France. 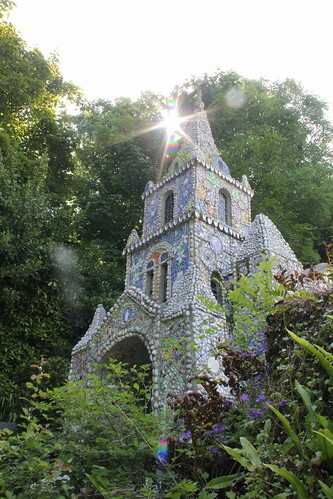 The Little Chapel is covered in broken pottery and shells and is really lovely. You can only get about 5 people in the whole building. I love it. It’s really quirky and unusual. I have had a very busy day today as I have been on training. Tonight I feel slightly braindead and I am not sure I will make much sense! The nice end to the day is that my in-laws are over visiting for a week so after we had picked them up from the airport we took a drive back around the coast, stopping to take a few photos of the gorgeous sunset. 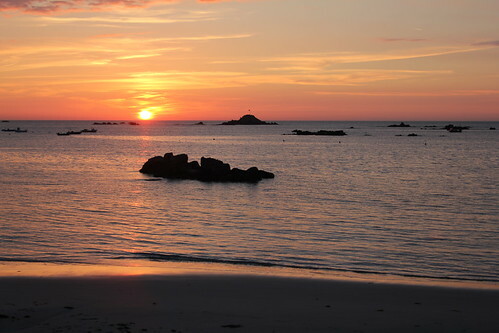 As ever this is of Cobo Bay. You just can’t beat it! We bumped into my Auntie Karen at the beach taking a photo. She is doing the Blipfoto thing which is a bit similar to the 365project. I wonder if she will post her photo of the beach too… you can see her Blipfoto project here. 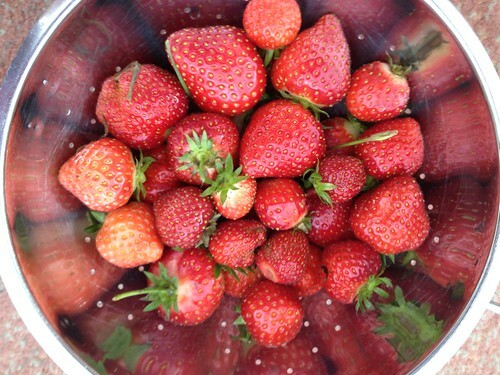 Today I picked these delicious strawberries for our tea. One of the good things about the Mum and Dad being away is we get to eat all the strawberries in Dad’s fruit cage! They were delicious, sweet and juicy and a perfect way to finish our dinner.